Disposing of a mattress & other bulky waste in Charlottesville VA isn’t as difficult as it seems. For people living in the City of Charlottesville Virginia who have their garbage picked up by the City collection service, there’s an offer of a special pickup a couple of times a year for bulky waste like mattresses, box springs, and furniture. The thing is, you have to request this service days or weeks before you need to have your bulky waste hauled away. Plus, you have to pay added fees for this service when you request it. Pickup of a single item can cost you anywhere from $35 to over $100. So many Charlottesville residents have had such a problem with this supposedly convenient removal service when they need to get rid of an old mattress or two that they often look for other, easier ways to dispose of their bulky waste items. There are plenty of other options for throwing away an unwanted mattress and other bulky waste in Charlottesville, but they can be hard to navigate for some. In this article, we’re going to tell you where and how to properly dispose of a mattress and other bulky junk in Charlottesville VA.
As I mentioned above, you have to pay the City extra fees before they will pick up your old mattress or other bulky waste, and it gets more expensive the more you have picked up: $35 for the first one, $50 for the second, and $100 for any more than that. Because these payments are non-refundable and non-transferrable, even if somebody grabs the bulky waste items from your curb (which you already paid a lot of money to have picked up), you won’t get your money back and you can’t get credit for the amount towards another pickup. The City of Charlottesville’s fee structure isn’t the only problem. It can be weeks before your mattress set and other bulky waste items are picked up after making the request and paying the fees. Some Charlottesville residents have had to wait even longer because there were so many other people requesting special pickups ahead of them. This is a big problem, especially for people who are on a time crunch or don’t have space to store something like an old mattress. So what happens if you get fed up or run out of time and take your bulky waste to the curb anyway? Your stuff won’t get picked up, and you’ll get a ticket for illegal dumping. You could haul your bulky waste items to the dump yourself at this point, but you would still have to pay those collection fees on top of the disposal fees you’ll have to shell out when you get to the landfill. And what if your car is too small for you to haul a mattress, box spring, furniture, and other large pieces? You could rent a truck, but that will eat up even more of your time and money. Because there are so many hurdles involved in throwing away a mattress or other bulky waste, many Charlottesville residents try finding a better way to get rid of bulky waste. No matter your reasons for needing to get rid of a mattress or other large bedding items, making sure your mattress is disposed of responsibly will help you have a more positive impact on the environment. Because over 63,000 mattresses are thrown away every year, mattresses are notorious for pushing landfills to capacity. This is a dangerous situation since mattresses contain chemical flame retardants, which are toxic to humans and wildlife. When mattresses are dumped in a landfill, these chemicals leach from the mattress and seep into the groundwater, contaminating the local environment. That’s why it’s so important to recycle your unwanted mattress instead of throwing it away. However, recycling a mattress in Charlottesville, VA is a problem because Charlottesville doesn’t have a mattress recycling program. Instead, you might be considering donating your mattress to a Charlottesville charity. Unfortunately, there are no charities in Charlottesville that will accept a mattress donation, due to public health concerns. So how can you make sure your unwanted mattress doesn’t end up in the landfill? There are a few eco-friendly bulky waste removal companies in Charlottesville that have the resources and environmental commitment to haul your old mattress and other bulky waste to a recycling center or charity that will accept mattress donations, in an effort to divert it from the waste stream. These mattress and bulky waste removal companies are the best choice for mattress and bulky waste disposal when you want to protect the environment and Charlottesville communities by keeping your mattress and bulky waste out of landfills. In addition to being much more environmentally sound, a green mattress removal service is perfect for anyone who wants to avoid the hassle and frustration usually involved in disposing of an old mattress and other bulky waste. 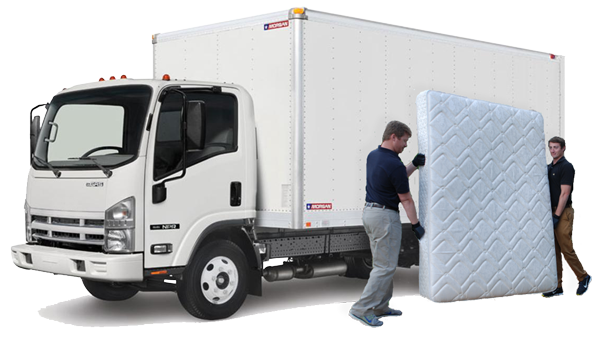 When you book a pickup with a Charlottesville mattress removal company, they send a small team to carry your mattress and bulky waste from inside your home and out to their truck where it is loaded up, hauled away, and disposed of properly. Using a removal company is basically like hiring a moving company, except that your bulky waste items are hauled away forever instead of being delivered to your new home. If you’re looking for a Charlottesville mattress removal company to pick up your old mattress and want excellent service, fair and upfront prices, eco-friendly disposal, and a commitment to the communities they serve, then Mattress Disposal Plus is the one for you. Mattress Disposal Plus has prices that are an average of 20-30% lower than any other mattress and bulky waste removal company. They’re upfront and honest about their rates, giving you an all-inclusive cost before you even book. Gone are the days of waiting around all day for someone to give you a “free” onsite estimate (that you know is much lower than what you’ll actually be paying) when you book removal service with Mattress Disposal Plus. Mattress Disposal Plus’s loaders are bulky waste removal and disposal pros you can trust to get the job done right. It’s easy to see why residents of Charlottesville VA choose Mattress Disposal Plus for haul away and disposal service when they’ve got bulky waste to get rid of. Give us a call or chat with us online to learn more about our mattress removal & disposal services in Charlottesville VA and how you can book a pickup with us. Need help removing your old mattress?